Unreal is the only word to describe my experience at Quilting in the Garden at the Alden Lane Nursery in Livermore! More than I could ever have imagined. I have attended Quilting in the Garden, so I knew it was a well attended quilt show. But the personal experience was so much more than my observation. My Kantha blanket (number 128) at the entrance display. Thursday morning I dropped off about forty of my quilts. Cyndee Carvalho is the coordinator of Quilting in the Garden, and she is quite an artist herself. She had looked at all my quilts online, and created a backdrop and a vision for how the quilts would be displayed. I arrived early Friday morning to teach, so I had plenty of time to go and check out my quilt display in the greenhouse. Cyndee had grouped my quilts so well, and added parasols and the HAND DYED clothespin circles to enhance the circles that I love to use in my quilts. The backdrop was painted in a color to enhance my quilts! This is what I saw coming through the front door of the greenhouse. Saturday I arrived bright and early. I loved getting there early. It gave me plenty of time to prepare myself and be relaxed before people started arriving. There were so many people! At one point on Saturday morning, I looked up, and the entire room was just FILLED with people! Cyndee came by a few minutes later and said that 250 people per hour were coming through the nursery’s front entrance! Here are some more pictures of the display wall. And then many of the quilts were hung at various heights from bamboo stakes (perfect for a nursery display!) I wanted people to be able to see the stitching up close, and was so happy that all the quilts were at the perfect level. So many people came, and spent time looking closely at the quilts and the stitching and the wording. Many read the descriptive tags that I had written for each one. So many people commented that they enjoyed the message, and that the entire room had a calming effect on them. 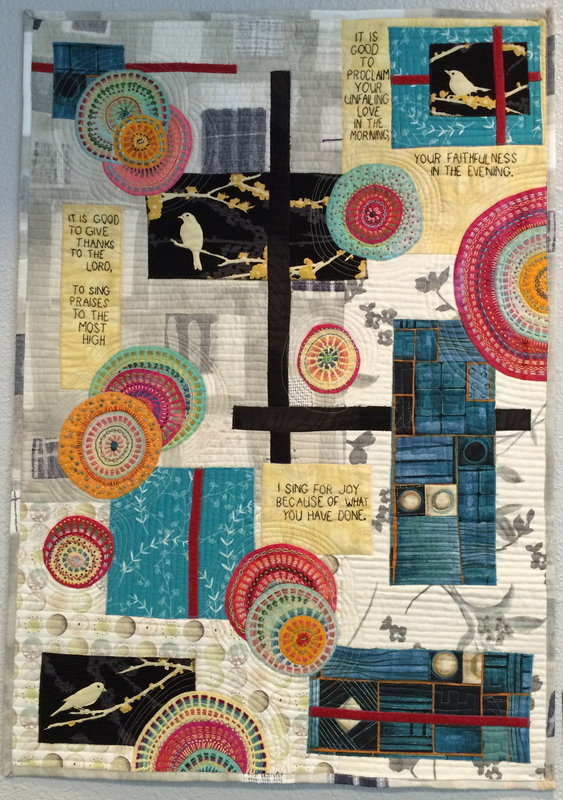 I loved chatting with the people about my process and inspirations for the quilts. This was the perfect place to display the Hallelujah! quilt. The filtered sun came through those windows and it glowed. You can see the corner of the table that they put there for me. I had some of my very small quilt samples on the table as well as a few small quilts for sale, and some of the embroidery kits that I assemble for my class. And, I had some room to sit and stitch too! The other Kantha blanket and The Fire Quilt. By Saturday morning, they had artistically placed lots of plants around the greenhouse. Since this was at a nursery, and my garden has been greatly influenced by this nursery, I brought my two garden quilts and had a bunch of 8X10 photos made of my garden. Cyndee displayed all the photos I brought, and that was so fun to share with the gardeners who came through the exhibit. His Kingdom Will Never End was displayed to the right of the entrance door. I know that this will probably be a once-in-a-lifetime experience. To be able to share so many of my quilts at one time, and to be able to interact with the people who are viewing them–it was…unreal! Since this is an outdoor show, all the quilts have to be raised each morning and taken down each night! They have an army of volunteers to hold the quilts as they are raised by a pulley into the air! I had a number of inquiries about teaching, and so maybe I will be teaching my Quilted Embroidery a little bit more in the future. I haven’t talked about my Friday class experience. I will just say that there were 23 students, and it seemed that they enjoyed the class. I provided a blank quilt sandwich, and 3 pieces of hand dyed fabric, as well as 20 colors of thread. I was happy to see that many of them had their own ideas, and made designs other than my favorite circles! I had lots of sample mini quilts and ideas for them to see. And then they were off to create their own quilt. During the day I demo’d the various stitches for small groups to see. One of these days maybe I’ll remember to take pictures at my class. Posted in Exhibiting quilts, Quilting in the Garden, Teaching! The eighteen quilts in the What They Said series will be in a solo exhibit at the Art & Soul Gallery from May 14 through June 18! There will be an Artist’s Reception on Friday May 19, from 7 to 8:30 pm. I would love to see you there! People often ask “how long did it take?” All quilters know this is a funny question. Here’s how long it took to make all eighteen of these quilts. First, I pieced all the little cross-cut squares on a self-retreat. I had no idea what I was going to do with them. I just had fun making them. Then one day, and I don’t know how I got the idea, it occurred to me that I would like to do a series on how people responded to Jesus, and what they said. So I started going through the Gospels and taking notes in my journal. I knew right away that I wanted the words to be the main feature in these quilts. Then one day, when I had run out of anything to embroider, I got all the little tops out, and I made each one into a quilt sandwich. And I put them into the closet. But I started embroidering the words, one quilt at a time. I thought about what people were thinking and feeling when they said what they said, and I tried to include that in the embroidery, and later in the quilting. Finally, all the embroidery was complete, but they stayed in the closet for quite a while. And one day, when I was ready to quilt, I got them out and started quilting them one by one. I really enjoyed the quilting. In most of them I included little clues as to the setting. In the meantime, I ordered many cradled wood panels to mount the quilts on. I tried staining them, but did not like that look, so I painted them all black. I think it sets off the quilts nicely. So…. the answer to the question “how long did it take?” is a mystery. I worked on them, on and off, over a two year period. I loved this process, and I am proud of these quilts. I hope that they inspire others to see scripture differently, and to think about their own response to Jesus. If you are in the area, and are free next Friday, I’d love to see you! 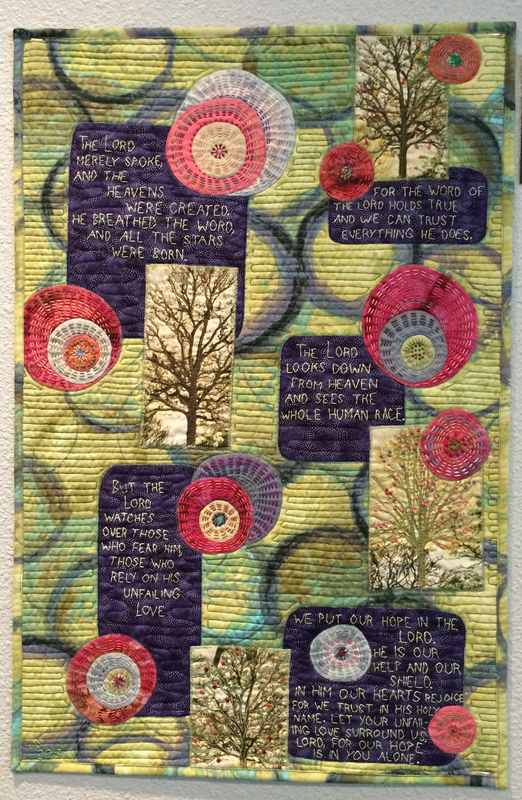 While I was at Empty Spools, I got an email that two of my quilts had been accepted into the Sacred Threads exhibit! I was very excited. But when I read which two had been accepted (I entered four,) I was surprised, and then a little sad. My Hallelujah! quilt, that I worked on for so long last year, was not one of the two accepted. And then, of course, I started to doubt myself. Its just a stupid quilt with a lot of words on it. It has no artistic merit. Fortunately, I had the quilt with me, and so I rolled it out on the bed, and thought, I still like it! Who knows why some quilts are accepted, and others are not. I am glad about the two that were accepted, as they have rather limited possibilities, as fas as exhibition goes. Some more good news! Do you remember when I entered a few of my quilts in Quilting in the Garden, held in September at one of my favorite nurseries? Well, when I picked up the quilts, the woman that coordinates the show told me how much she enjoyed my embroidered quilt, and asked if I ever taught. Now, I don’t want to teach all the time, but Alden Lane Nursery is one of my favorite places to visit, and I also have really enjoyed taking classes there. They do a quality job of coordinating the class, and it is a beautiful location, of course. If you have been thinking about trying quilted embroidery, I hope you will join me at Alden Lane Nursery on Friday, September 22! One of my quilts was accepted into the SAQA exhibit “Inspirations II!” The exhibition will be held at the San Jose Museum of Quilts and Textiles. Here’s information about when and where. At the same time, there will be a special exhibition of Kaffe Fassett quilts along with the antique quilts that inspired them. What a great time to check out this wonderful museum. This week I have been putting together kits for the Kantha stitching class that I am teaching next month. I decided to see what I could create with just the materials I supplied for the kit–a quilt sandwich, 3 colors of hand-dyed fabric, and 20 colors of thread. Very fun! Yep, there was plenty of thread and fabric included in each kit! I still have some thread, and about half of the hand dyed fabric left over. Posted in Exhibiting quilts, Teaching! When last I wrote I was working on finishing a couple of quilts, in hopes of entering them in the Modern Quilt Guild’s QuiltCon show. Oh, I just checked, and I didn’t mention that I was planning on entering them. I seldom enter quilt shows, for several reasons. First and foremost is because I am not organized enough to plan ahead for deadlines. Secondly, they are expensive to enter! And third, I don’t actually agree with how some quilt shows seem to be judged. Rather than looking at the quilt as a whole artistic piece, the quilts are sometimes eliminated for technical details, like a less-than-perfect binding. (don’t kill me for this statement–its commonly written about by judges and entrants alike.) I used to show dogs, and sometimes the same thing would happen. Dogs were eliminated for certain small faults, and so in the end sometimes a common-looking dog would win, and the most beautiful outstanding dogs would be dismissed from the ring. So, the fourth reason I don’t enter is because I know that my quilts have some of these common technical “faults,” and I am unwilling or unable to change those things. Back to the Modern Quilt Guild. It is having Quilt Con here in my state next February. I was quite excited about this, and joined so that I could have a chance to get into some of the classes, and I decided to splurge and plan to spend all four days at the show. So then I thought about trying to enter a few of my quilts. I’m not sure if they are modern, but I know that they are different, and I would like to share them with other people. The deadline was November 30, and right on time, there I was on November 30, filling out the online entry forms, and taking pictures of my quilts with the right amount of pixels per side. In the end I entered six quilts. I told my BF that it was my version of playing the lottery. Maybe if I entered more, one would make it? Most of me knows that there is very little chance that they will make it into the show. The other part of me actually enjoys my own work and knows that it is worth being seen by other people. Here are the last two that I showed you almost finished, and that I entered. The other four you have already seen elsewhere on the blog. After getting all those quilts entered on November 30, I followed my plan to “switch gears,” and I have been working on my rug hooking since then. I’ll write about that later in the week. And now I want to go to Washington D.C. this summer! The exhibit will be held at Floris United Methodist Church, Herndon, VA (outside Washington, D.C.) from July 10-July 26.